Frost & Frost, LLC is a Houston, Texas based company engaged in art, game, and book publishing business. The company is the publisher of the award-winning SQUAREMINO® board game and 2017 sci-fi thriller The God AI. Co-founder Wenlan Frost is a museum-exhibited American artist with an M.S. degree in Management of Technology from MIT Sloan School. Her artwork spans from painting to digital art and design. She also runs an Etsy shop for a variety of her artistic offerings. 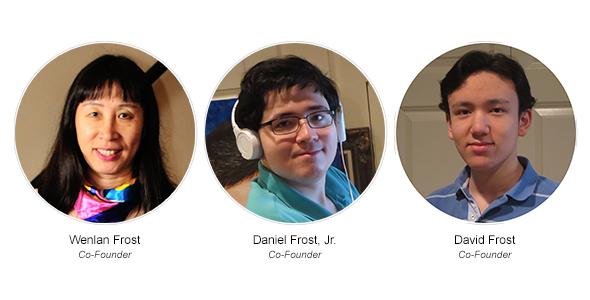 Co-founders Daniel and David, age 19 and 16 respectively, are Dan and Wendy’s sons. Daniel is a National Merit Scholarship Finalist. He has written dozens of science fiction short stories and published his first novel, The God AI in 2017. Currently, he is a junior majoring in Mathematics at the University of Texas at Austin. David is a Scholastic Art Regional Silver Key Award winner and taking college classes. They both love board games and video games. Our mission is to create innovative, artistic and intelligent products based on the concepts of art and mathematics. Through our products, we strive to enrich people’s lives, bring people new forms of entertainment and happiness, and connect people everywhere in the world. We also believe that we can enhance children’s cognitive, analytical, and strategic thinking mindset and skills through playing board games and other products we designed. We are proud to have an opportunity to make our contributions to mankind through our work and products.